"Love Is The Most Important Thing "
Welcome to "Love Is The Most Important Thing "
If, you have a family, as I do there is so much animosity and resentments and hate filled hearts that I get so upset and angry about, why? At the time of this, my mother was 79 and fixing to be 80 years old, she is now 80 years old, and it seems that my family are so selfish in their time and just can’t not all come together just for one day to show her that those which cause the trouble or demand to be the center of attention just can’t make a get together peaceful and allow the family to actually enjoy being together and being able to really be a family of love one time. There are some in my family who say they love, but yet they think of how they feel, not about how other’s feel. God never said, only show someone love when you feel like it, He plainly told us to show “LOVE” all the time and not be selfish minded. How can we show Jesus’ Love which He showed us if we are not following what He told us, to do to others and not just focus on our own needs and wants and desires? 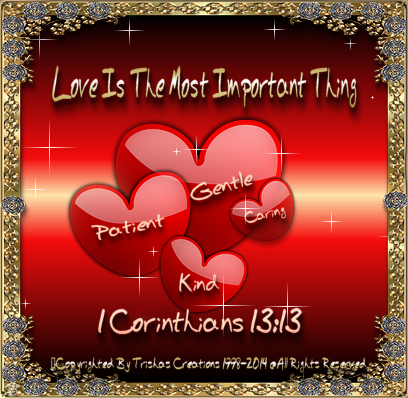 1 Corinthians 13:13, tells us that LOVE is the greatest thing. However Faith and hope are vital and necessary even though they may be vital. LOVE is most important. Some people say they love and look at it as if, it’s a theory, or just plain talk. But, they are all so very wrong. Love is shown in a variety of ways, like how we talk and express ourselves to others, how we think of others, how we carry ourselves. It’s all about how we treat other’s, and how we act towards them. It’s about how and what we do and don’t do for them. It’s about being there, always desiring to want to do things with them and for them. Love is no matter what they are also dealing with, it’s being there through thick and thin, it’s not about critizing them, or back stabbing them or talking bad about them and their faults, because I hate to inform you, but everybody has faults, no one is perfect or exempt. Love us shown in so many ways, love is not selfish, bitter or hateful or rude…love is not full of malice. Well, no you don’t but …… stop and think, how you are treating them we are to show “LOVE” no matter how someone treats us! Love is always thinking the best of other’s, it’s putting love in their lives by us letting them see the love within us. Love is not rude, it strives to have good manners, and this world surely needs that. When we walk in love, no matter what or whom we come across, we are to walk in love, we are long suffering, we all have weaknesses and we deal with them and the faults of others. Love is a special gift which was given to us, and we are not to believe in the worst, because Love always shows and believe in the best of a person. It takes times to say “Please” and “Thank You” and being polite, showing honor, it’s all about giving of yourself. Love actually takes the time to listen to someone who is talking, not only about yourself, love is being interested in other’s, Love builds people up. Love does not find faults and criticize others. Love covers sin, Love Conquers things we never even thought about. Love isn’t about being a nosey nose, exposing how other’s faults are, nor is it about telling someone else’s business. It actually covers more than you think. Loves doesn’t go and plaster some ones faults or sins, it covers them we should not be that way, we are to love and show love UNCONDITIONALLY! We are to always be in faith and hope, but we are to always walk, talk and express act of love given to us by Jesus, remember what He did for you He died for you to show you His true Love!